Lot Detail - Brett Hull's 1989-90 St. Louis Blues Game-Worn Alternate Captain's Jersey with His Signed LOA - 72-Goal Season! - DK Patch! - Photo-Matched! 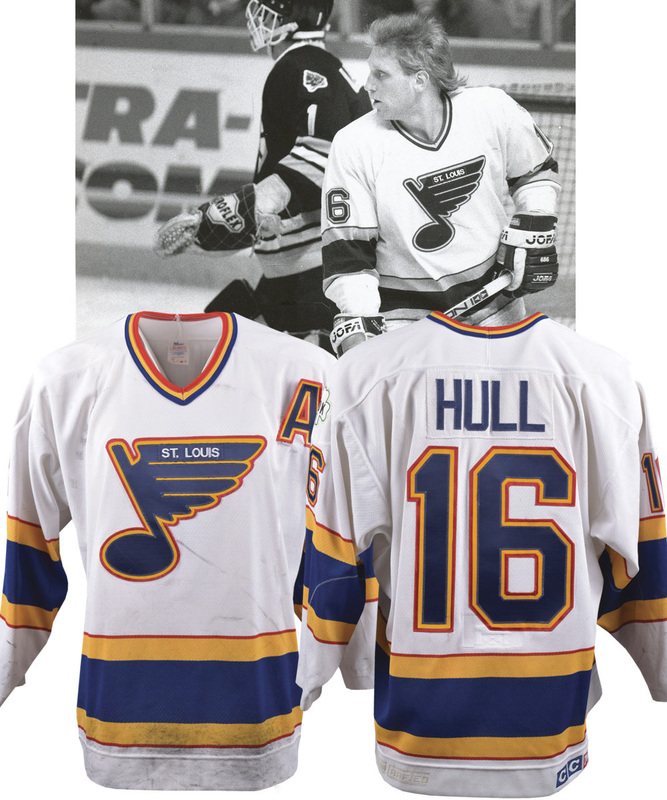 Brett Hull's 1989-90 St. Louis Blues Game-Worn Alternate Captain's Jersey with His Signed LOA - 72-Goal Season! - DK Patch! - Photo-Matched! Just his third season in the Gateway City, Brett Hull would score an impressive 113 points including 72 goals in 1989-90 – the ninth highest single-season goals number – while earning the Lady Byng Trophy. Hull would also be selected as a First Team All-Star, his first of three consecutive honours. 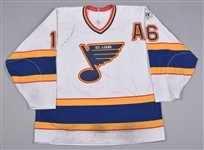 We have a St Louis Blues alternate captain’s jersey that was worn by the superstar in 1989-90. Photo-matched vs the Bruins, the Blues would play Boston twice in 1989-90, first on Nov 29th, then again on March 27th (78th game of season), with Hull scoring his 71st and 72nd goals of the season in game #80 on March 31st 1990. We don’t know if the Blues played Boston in the preseason, but the jerseys the Blues wore did have velcro nameplates during the preseason. A Maska Air-Knit label along with “52” handwritten sizing is affixed to the collar, with embroidered CCM and NHL crests on the back bottom hem. Featuring an attractive vinyl and tackle twill blue note team crest with “St Louis” embroidered-on, the solid white sweater has been accented with tri-colour sleeve and verso numbers, with the Dan Kelly memorial patch over the left shoulder. The fight strap has also been cut away and removed. A signed LOA from Brett Hull will accompany. Absolutely hammered with use, a ton of dark marks litter the lower front, with a number of large stick marks over the upper section. Additional marks also cover each sleeve along with board burns. 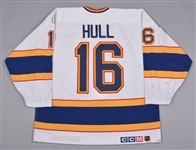 The alternate’s “A” is loose and was affixed to the jersey hastily, with Hull not acting as a full-time alternate yet at this point, suggesting short-lived use, with his serving as possibly his first “A”. An included numeric image has been matched to a number of marks on the jersey including the big slash below the team crest, the stick mark below the front right shoulder and the white mark in the "6" of “16" on the right sleeve.